Juliette Sivertsen and John Barrett building a house on a rural site in Queenstown. New Zealand remains one of the most expensive places in the world to buy building materials with prices 20-30 per cent higher than Australia but a building sector veteran says the Government has the solution. It should contract a large overseas construction company to come to New Zealand to deliver KiwiBuild houses, says Tony Sewell, former chief of the biggest property company in the South Island, Ngāi Tahu Property. With such a big contract, the company would likely bring its own supply chain and prompt a rethink among the three or four domestic suppliers of building materials, thereby benefiting all consumers. "Once [the limited supply problem] is busted, it's busted. It would force the New Zealand suppliers to change their strategy. There is no circuit breaker at the moment." People who are building one house could do nothing about prices and nor could even our biggest building companies, said Sewell, who is on the board of Generation Homes. "Our market is small and therefore it is about scale. But I can't believe when the Government has [100,000] houses to build it just doesn't go and solve the scale problem. "Give them [a major overseas builder] a Government contract and they'll be here tomorrow." Having missed its first-year target, the Government has scrapped targets for this election cycle but says it still aims to build 100,000 affordable homes - half of them in Auckland - during the next decade. And Housing and Urban Development Minister Phil Twyford called for an inquiry into the price of building materials soon after coming to power in 2017. Sewell said incentivising local builders won't help with costs because they use existing suppliers who charge what people will pay in a market where competition is limited. "The problem is there is no one outfit who wants to build enough houses that will consider an alternative supply chain. I suggest that the Government is the only outfit that could actually do that." Twyford told the Weekend Herald that international companies were among those to have expressed an interest in KiwiBuild contracts. "The two ways we can best drive down New Zealand's very high build costs are bulk purchasing, taking advantage of large scale multi-year orders, and through off-site manufacturing. Both are part of the KiwiBuild plan." While the Government wants the local industry to grow, it is "also very open to international companies which are used to working at scale". Juliette Sivertsen and husband John Barrett did the site work themselves to reduce the dizzying cost of building a house in Queenstown. "That's why we invited companies both here and overseas to pitch their ideas to KiwiBuild to set up offsite manufacturing plants in New Zealand," Twyford said. An offer to pitch had gained 105 responses by close last November of which 44 had been invited to take part in the next stage of the offsite manufacturing evaluation. The minister would not disclose how many of the 44 were from overseas. KiwiBuild expects the majority of commercial negotiations and contracts to be finalised by the end of the year. Five years ago Sewell was considering adding house builder to the activities of Ngāi Tahu, a property investment and development company. 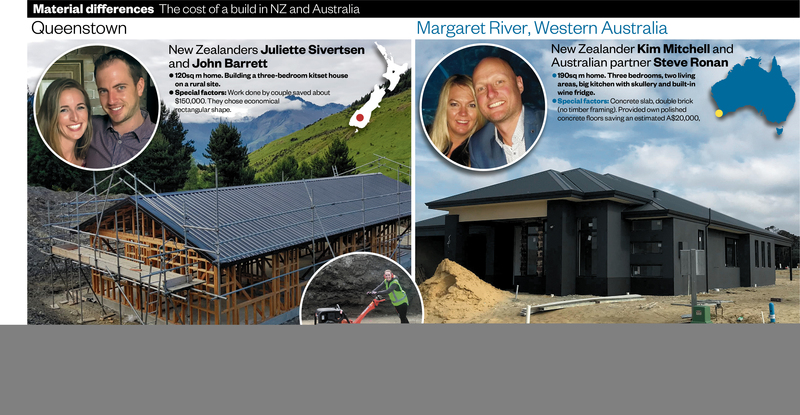 Juliette Sivertsen and John Barrett did the ground work for their rural Queenstown home themselves to save money. He'd had staff research comparative costs of materials and told the Herald at the time he nearly fell over when he saw how much cheaper materials were in California. A piece of 100mm by 50mm timber was four times the price here, wallboard was three times the price. Nothing had changed, he said this week. New Zealand remains one of the most expensive places in the world to buy building materials. Sewell said he was surprised the Government, with the volume of houses it has committed to build, was prepared to pay that price. "They are in a position to change things." The Commerce Commission is to look at construction materials prices after it has finished its inquiry into fuel prices. Ex-pat Kiwi Kim Mitchell says she and her partner Steve Ronan, are building this 190-sqm home with three bedrooms and two living areas, in Margaret River, Western Australia, for much less than in NZ. The Government has amended the Commerce Act 1986 to give the Commerce Commission power to conduct market or competition studies either on its own initiative or at the direction of the Minister of Commerce and Consumer Affairs. The Commission is receiving up to $1.5 million more each year to conduct these studies. The Productivity Commission has estimated we pay between 20-30 per cent more than Australians for building materials. Many industry commentators question whether that is a fair comparison and the need for an inquiry. "We have a population the size of Sydney spread over a country the size of the UK," John Tookey, head of AUT University's Built Environment Engineering Department, told the Herald earlier. The nearest big economy was 3000km away and merchants had to set up storage chains up and down our long country which made for high overheads, before the bespoke nature of Kiwi buildings was factored in. And, the New Zealand Institute of Economic Research has pointed out that benchmarking the costs of materials is difficult because of different materials used in various countries. However, as these examples show, the cost of putting a roof over your head is enviably lower in Western Australia. Ex-pat Kiwi Kim Mitchell and her partner Steve Ronan are building in Margaret River. Juliette Sivertsen and husband John Barrett found their dream site near Moke Lake in the Queenstown hills but material costs mean they are building a no-frills rectangular home in the town they fell in love with on their honeymoon. Their alpine section was so densely covered in native bush and wilding pines they couldn't get on to the property. "There was a gate and a fence," said Sivertsen, a journalist. They bought a 7 tonne digger and set about clearing a short driveway, then a space to pitch a tent and much later a building platform. "It's a hugely ambitious project. It might make or break us but it's all good at the moment." Barrett, a construction manager in Auckland, dug the trenches, and holes for septic and water tanks and built a 10sq m sleepout where they live while working on the house. Juliette Sivertsen and John Barrett are building their home in rural Queenstown. "We have gone for a plain rectangular shape because that was the cheapest. We scrapped an entrance-way because every time you add a corner the cost goes up." A deck, too, will have to wait. They were told to expect to pay at least $3000sq m to build in Queenstown but compromising on design and doing about $150,000 of the work themselves had pared the figure back to about $2200. The house has a timber frame and board and batten cladding and will be painted by them with the help of friends. In contrast, Kiwi expat Kim Mitchell is building a bigger home with high-specs in Margaret River, a two-hour drive south of Perth, with her Australian partner Steve Ronan for $1300 per square metre. The region is not prone to earthquakes and building codes are different. Their home is built with a double layer of bricks on a concrete slab but does not have a timber frame. The home has two living areas, a large kitchen with scullery and a built-in wine fridge. The cost of a build in NZ and Australia. View our graphic here. Ronan owns a polished concrete company and provided the floors himself, saving about $21,000 but Mitchell said she was shocked at the cost compared to New Zealand. "It's really cheap to build here, it's nuts." She had visited a luxury show home which she said could be built for as little as $2300sq m.
"That's luxury. It has just blown me away. I love New Zealand, don't get me wrong and I'd probably move back in a heartbeat, but financially it doesn't make sense."